Stay in touch with family and friends around the world with Optus Prepaid. All for use in AU in 28 days. Fair Go Policy applies. To see international rates for your plan, click on your plan name below. Want unlimited standard calls on Optus Prepaid Epic Data? Click here for more info. This list of rates applies to the My Prepaid Ultimate, My Prepaid Ultra, My Prepaid Ultra Plus and My Prepaid Daily plans. Each country has a different way of managing non-standard numbers. Some destinations have specific premium and special number ranges, in which case we will charge you more for calls, or may block calls to these number ranges. Because these non-standard numbers change all the time, we reserve the right to add or remove number ranges from any category set out below from time to time. machine answered calls (including looped dial-tone calls and machine-dialled calls). Unlimited Standard International Calls: $10 to $30 Prepaid Epic Data recharges provides unlimited standard international calls to 15 selected destinations until 03/06/2019. $40+ recharges provides unlimited standard international calls to 15 selected destinations as standard plan inclusion. Included destinations are Canada, mainland China, France, Germany, Hong Kong, India, Ireland, Japan, Malaysia, New Zealand, Singapore, South Korea, Sweden, UK & USA. Calls to other destinations and non-standard calls are deducted from included Extras Credit, see optus.com.au/prepaidint for rates. For calls made from within Australia. Expires in 28 days or on next recharge, whichever is earlier. Excludes premium/special/satellite/overseas toll-free numbers and video calls. 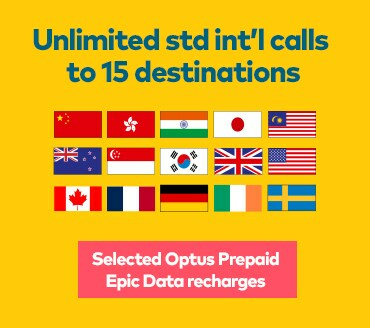 Unlimited Standard International Calls on $10 to $30 Prepaid Epic Data recharges provides unlimited standard international calls to 15 selected destinations until 03/06/2019. $40+ recharges provide unlimited standard international calls to 15 selected destinations as standard plan inclusion. The 15 selected destinations are Canada, mainland China, France, Germany, Hong Kong, India, Ireland, Japan, Malaysia, New Zealand, Singapore, South Korea, Sweden, UK and USA. Unlimited standard international calls and international calls offer is valid for calls made from within Australia and excludes premium/special/satellite/overseas toll-free numbers and video calls. Calls to other destinations and non-standard calls are deducted from included Extras Credit.